Held in Belgrade from 21st to 30th of March 2018, the competitive discipline this year is guitar. 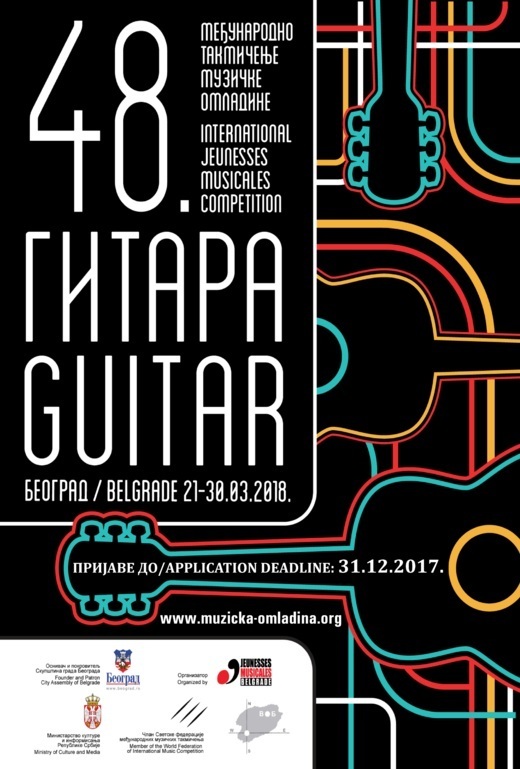 The 48th International Jeunesses Musicales Competition will be held in Belgrade from 21st to 30th of March 2018, and this year the competitive discipline is guitar. Applications are available at web portal www.muzicka-omladina.org and deadline for contestant to apply is 31st of december 2017. In this regard, we are honored to welcome prominent members of the international jury consisting of most renowned foreign and domestic guitarist - performers and educators. Honorary selectors of 48th International Jeunesses Musicales Competition are: Prof. Dušan Bogdanović (Serbia) Haute école de musique de Genève (Switzerland) and Prof. Vera Ogrizović, Faculty of Music, Belgrade (Serbia). Mandatory compulsive work by domestic composer in second stage of Competition is "Ricercar Kalij" by Dušan Bogdanović. International Jeunesses Musicales Competition Belgrade is one of the most important events that are taking place in Belgrade. Not only because of the long standing tradition, but also because of its significance and quality, Jeunesses Musicales Competition is an event that is recognized as an event of special importance for our city and our country, founded by the Belgrade City Assembly. Grand opening ceremony of the 48th IJMC Belgrade with special guests will be held on 21st of March at Kolarac Concert Hall.